While redecorating our entryway recently, I was having trouble coming up with something that could go in the narrow wall space next to our stairs. I find it to be a somewhat awkward corner to try to decorate. My original vision for the entryway included lots of greenery and texture. (This didn’t exactly happen, although I’m still happy with the results.) Then, one day, with that concept it mind, an idea began to form for that narrow little space – a hanging garden. I didn’t want anything real that would require maintenance, so, it needed to be something faux. 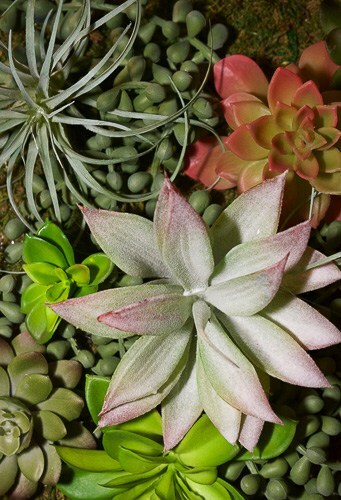 Succulents are all the rage right now, and I absolutely love the look of them. 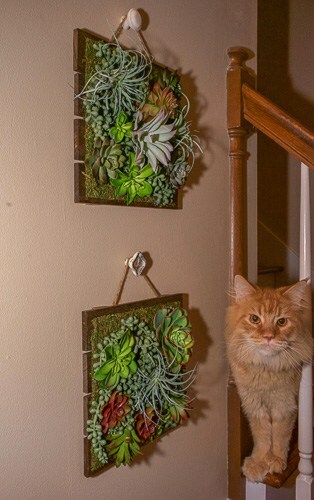 So, I decided to put together a faux succulent hanging garden. Have you ever started a project and been unsure about how it may turnout? That is how I felt when I started this little decor project for my entryway. I had a vision in my head but was not entirely sure I could pull it together. I am happy to report, though, that I absolutely love the end product. And what good is a blogger if she’s not willing to share her secrets. Right?! So, here is my tutorial for a DIY faux succulent hanging garden. 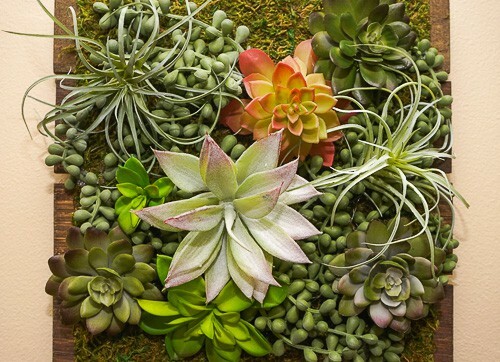 Now, this is a project that can potentially get pricey (especially if you are wanting a larger hanging garden), due to the amount of succulents needed to fill the space. So, be sure to watch for sales and take coupons with you. 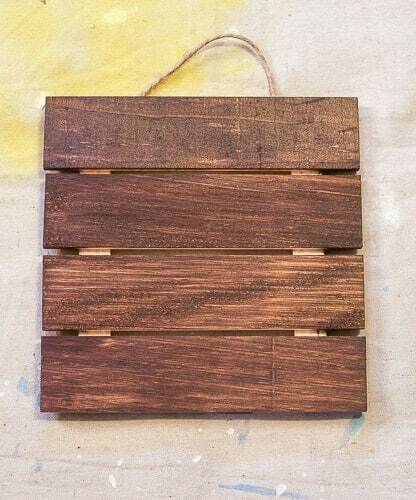 I found these little wood hangings at Hobby Lobby and immediately thought they would be perfect. Since they were fairly small, and my space is tall and narrow, I decided to make two. I wanted the wood to stand out against the color on my walls, so I put a quick coat of stain on them. 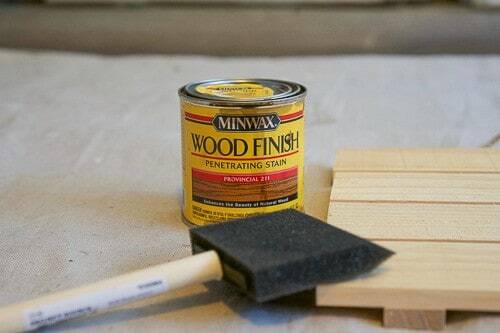 Fortunately, I already had some Minwax Wood Finish Penetrating Stain in my garage. Once the stain was dry, it was time to add the moss as a background filler. Before I even started collecting supplies, I was aware of the fact that it was going to take quite a large number of succulents to completely fill up the space. So, I decided to buy some moss to lay down first, to act as a filler. That way, I could get away with using less succulents, but still end up with a nice full looking garden. 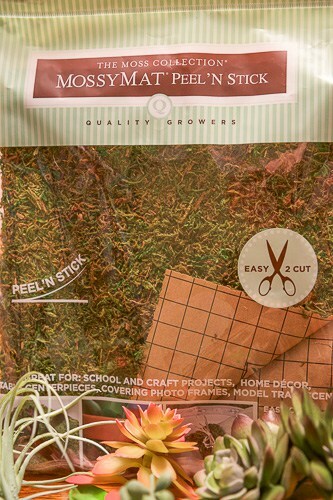 I used Quality Growers Mossy Mat Peel & Stick. 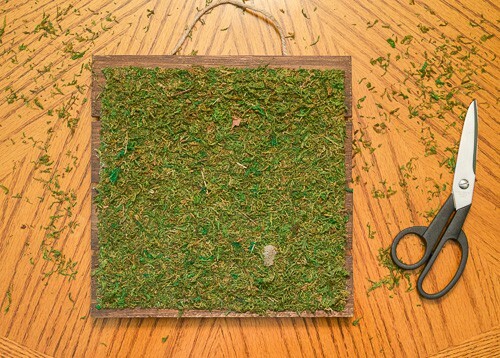 Then, I took my trusty glue gun, and glued the moss square down onto the wood. Yes, this is peel and stick moss, but I wanted to make sure that the moss was secure enough to hold up the weight of the succulents once hung. I purposely purchased a couple of long, viny succulents for each garden. 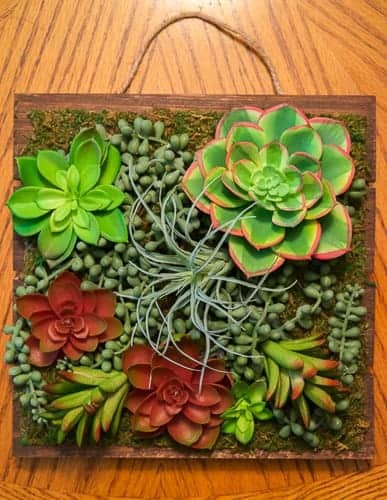 Again, to help fill space and cut down on the overall number of succulents needed. Those were the first succulents to go down. I positioned them how I wanted, then I glued only the stems down. Once these were glued, I cut off the stems of all of the other different succulents , so that just the head was left to work with. I arranged the succulents how I wanted before gluing them down. Then, using a very generous amount of hot glue, I glued each individual succulent into place. 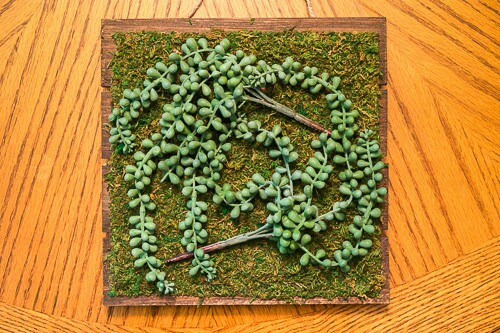 Finally, I glued down any loose ends and tails of the long, viny succulents. Due to the way these hung on the wall, I knew that the hanger would be exposed and visible. So, I decided to go with a decorative knob for hanging. The day I was at the craft store, there were a handful of random hardware knobs in the 90% off aisle. Unfortunately, there wasn’t a single matching pair. Since $0.70-$1.00 per knob sounded a lot better to me than $7-10 per, I chose to go with mismatched knobs. I love the final product. 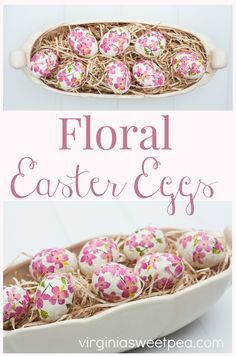 They were easy to make, and the best part is, they require absolutely no maintenance! And they fit nicely in the little narrow wall space next to my stairs. 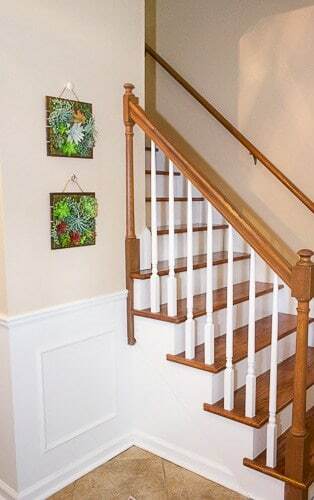 Don’t miss this post about how we also transformed our stairs recently on a budget. Very cute Amy! 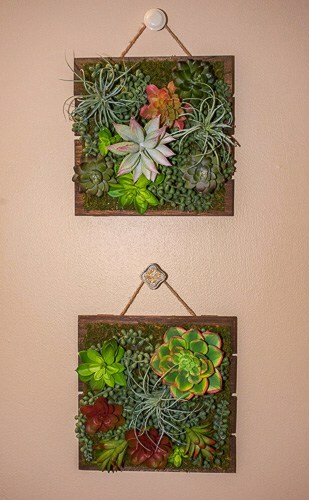 I love succulents and this is a great alternative to framed art. Visiting from Dishing It and Digging It party. Thanks so much, Victoria! I love succulents as well, so it’s nice to have some on display in my house. Especially since I don’t have to worry about keeping them alive. 😉 Thanks for looking! This is such a cute idea! I must try this! Thank you! They turned out even better than I expected! 🙂 Thanks for taking a look! I think I have that exact same pallette! Though yours is far more interesting than what I did with mine. Thanks so much for sharing at the #happynowlinkup! Haha! I’m sure whatever you did with yours was fantastic. 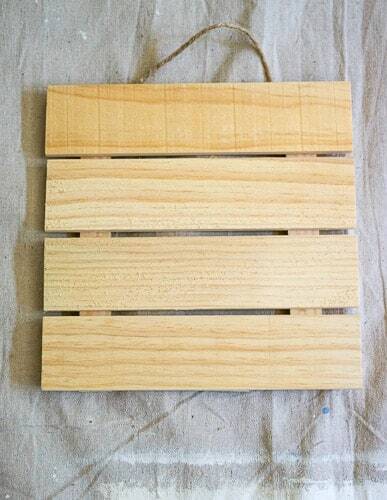 It’s a great little palette for decorating! Thanks for hosting a great party! Amy these are just gorgeous. 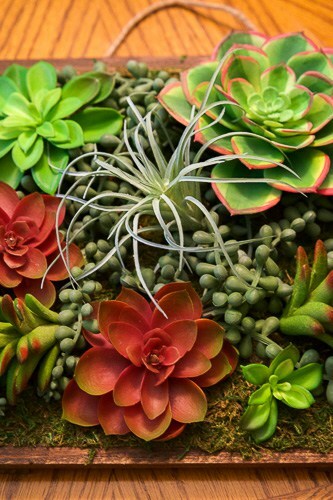 I’m a big fan of real succulents but they’re not always practical, especially for an inside vertical garden and the faux succulents you can buy now look so realistic. 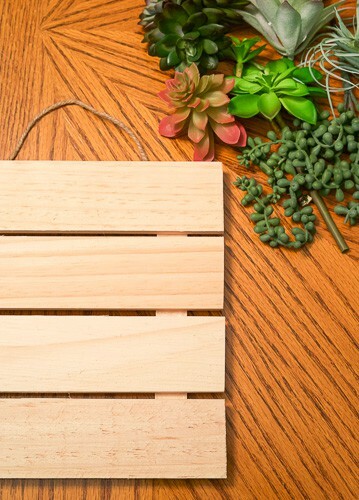 Great idea to use the moss mat as a background filler and I love the fact that the knobs you used to hang your garden don’t match. It adds interest to the whole look. Thanks, Michelle! I love real succulents, as well, but I am terrible at keeping indoor plants alive… I’m not too bad with outdoor stuff, but forget it if it has to live inside. So, I am a big fan of the fake succulents. And we love our furry sidekicks, as well. 😀 Thanks again! 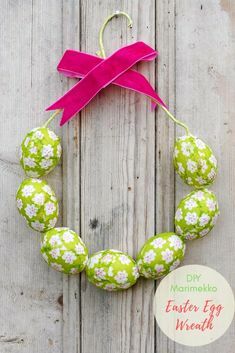 Amy,, this IS totally adorable & such a creative idea. I love the mismatched knobs. 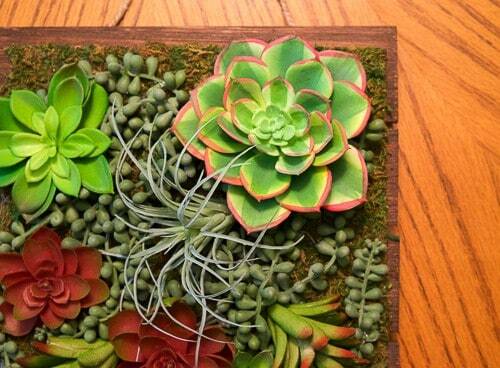 The faux succulent gardens are so attractive too. You’re right, the faux ones look just as good as the real thing. I love that bit of interest on your wall! You’re welcome Amy! I’m glad to do it! I love succulents ! 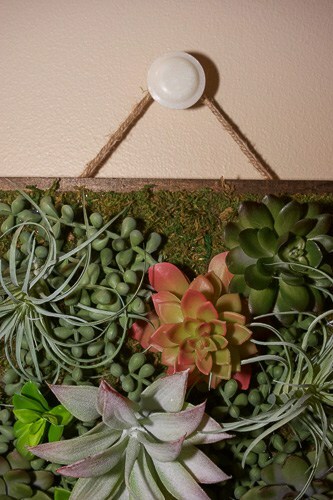 It is a great way to arrange faux succulents in your home. Recently I made a faux succulent garden in a shell! Right?! I can’t hardly take a photo without someone, or someTHING, photobombing me. Ha! Thanks for the share and for the lovely compliment!